Our Top Hinged Premium Lockable Poster Cases are heavy duty and robust, and ideal for indoors or outdoors, being fully waterproof, providing a secure and eye catching display. They are premium lockable poster cases which incorporate a heavy duty frame, gas door struts and a push lock mechanism for convenient opening and closing. They have has a 5mm correx back panel and a durable 6mm PETG front with a waterproof seal and top hinge to protect your graphics. 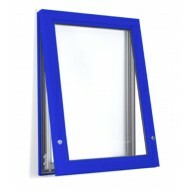 They are manufactured to order at our Uk facility to a colour of your choice, with 213 RAL colours available. Our Premium Top Hinged Secure Poster Case is ideal for a prestigious display. 1400mm x 1000mm (B0) Elite Top Hinged Premium Magnetic Lockable Poster Case for posters sized 1400mm..
1800mm x 1200mm (6 Sheet) Elite Top Hinged Premium Magnetic Lockable Poster Case for posters that ar..
20" x 30" Elite Top Hinged Premium Magnetic Lockable Poster Case for posters sized 762mm x 508mm. Ou..
30" x 40" Elite Top Hinged Premium Magnetic Lockable Poster Case for posters that are sized 1016mm x..
500mm x 700mm (B2) Elite Top Hinged Premium Magnetic Lockable Poster Case for posters sized 500mm x ..
60" x 40" Elite Top Hinged Premium Magnetic Lockable Poster Case for posters sized 1524mm x 1016mm. ..
700mm x 1000mm (B1 Elite Top Hinged Magnetic Premium Lockable Poster Case for posters sized 700mm x ..
A0 Elite Top Hinged Premium Magnetic Lockable Poster Case for posters sized 1188mm x 840mm. Our A0 T..
A1 Elite Top Hinged Premium Magnetic Lockable Poster Case for posters of 840mm x 594mm. Our A1 Elite..
A2 Top Hinged Premium Magnetic Lockable Poster Case for posters sized 594mm x 420mm. Our A2 Elite To..